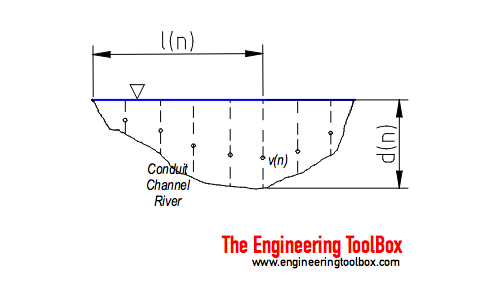 The velocity-area principle is based on velocity measurements in a open flow like a conduit, channel or river. The accuracy of estimate depends on the profile of the conduit and the number of measurements. For conduits with regular shapes like rectangular channels a limited number of measurements are required. For irregular shapes - like natural rivers or similar - higher accuracy requires more measurements both horizontal and vertical. Engineering ToolBox, (2017). Flow Rate Calculated based on the Velocity-Area Principle. [online] Available at: https://www.engineeringtoolbox.com/velocity-area-computing-flow-principle-d_1974.html [Accessed Day Mo. Year].